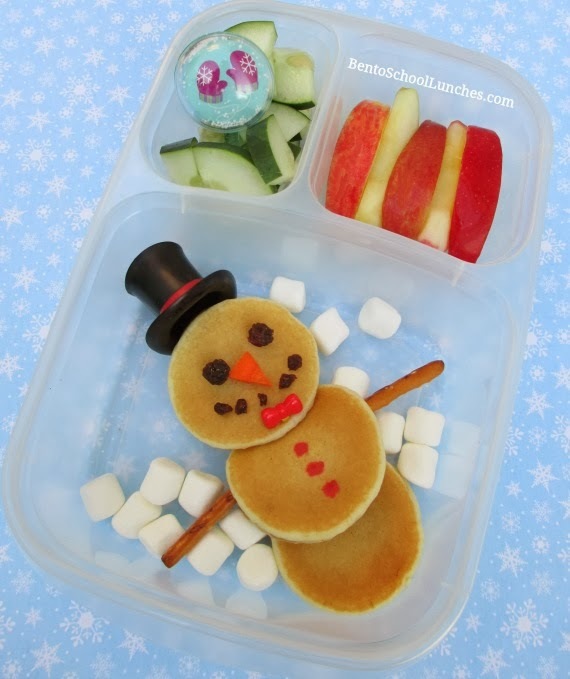 Today is the last day of school for this year and I made a quick and simple Snowman pancakes breakfast for lunch. Merry Christmas and Happy Holidays from our family to yours!! Mini SunButter pancakes (they are stacked) with carrot nose, raisin eyes and mouth, pretzel sticks for arms , food safe marker buttons and mini marshmallows for snow. I added a little bow tie pick. Cucumber slices with a snow-globe cupcake pick. Apple slices. This lunch is packed in our Easylunchboxes container. Cute snowman pancakes and Merry Christmas Rina! The snowman is so cute! Love the idea of mini marshmallows as snow. Such a cute idea! And yummy!